The continuation of the migratory control operations of illegal aliens on the Dominican territory made it possible to arrest 433 Haitians, in La Romana and in the sectors of Guaymate, Bancola, El Peñón of Villa Verde and Los Mulos as well as in San Francisco de Macorís. Teams composed of supervisors, inspectors and agents of the Directorate General of Migration (DGM), with the support of military personnel and representatives of the Public Ministry, participated in the operations conducted at the request of Lieutenant General Máximo William Muñoz Delgado, Director General of the DGM, following information from the intelligence service and denunciations by Dominican citizens on the presence of illegal Haitians. 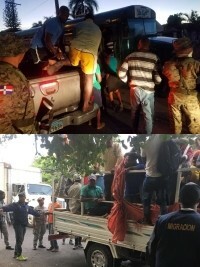 After the depuration process, 210 undocumented Haitians were transferred to the border posts of Dajabón and Elías Piña to be registered and deported to Haiti, the others in good standing, were released.